United Yacht Sales New Jersey would love to guide you through a personal showing of this 70' Neptunus Motoryacht /flybridge 2001. 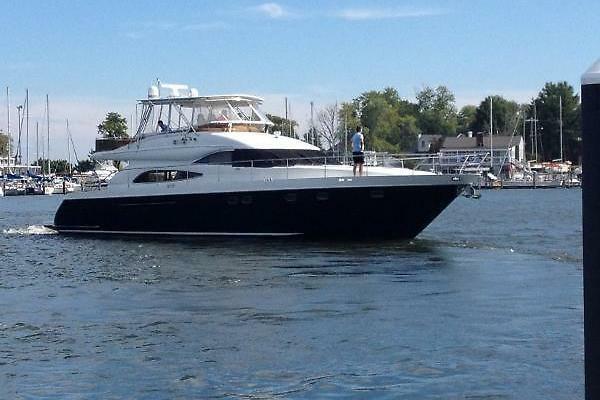 This yacht for sale is located in Hollywood, Florida and priced at $895,000. For a showing please contact us by filling out the form on this page and we will get back to you shortly! “MAGIC MOMENT” may be entered from either the swim platform on a floating dock or from midship boarding gates on her main deck via the wide walk around side decks. The hydraulic swim platform allows easy boarding via port and starboard curved steps to the spacious Aft Deck. The Aft Deck offers both fixed and loose seating options. The Salon is entered via a sliding door. The area is very spacious due to the open plan layout including the Salon area, partial Galley bulkhead and Lower Station all the way forward. All soft goods are new. Steps forward lead down to (3) cabins each with their own private Heads. The VIP is forward and the full beam Master is amidship separated by a second Guest Cabin with oversize twin berths. The Crew Cabin is entered via the swim platform door and features a full size Head with separate shower and located just aft of the Engine Room. The Flybridge gives all weather navigation due to the hardtop and three side enclosure plus a great exterior Lounging Area. The davit can handle a small tender or wave runner. The Salon is entered via the centerline sliding door and is very spacious due to the open deck plan and panoramic side deck windows. Immediately to port is a U-shaped Ultra Leather settee recently recovered with storage below under most of the settee. The settee seats (6) and has a built in end table in aft corner. Above the end table is a curved lacquered finish cabinet with an auto light and a mirrored interior containing liquor storage. In front of the settee is a Burlwood topped hi lo coffee table, 26” x 50”. Table is teak and Burlwood with maple inlay and a high gloss finish, new 11/13. There are hidden rope lights around the perimeter of the settee for soft night accent lighting. The forward bulkhead is mirrored with a small Burlwood shelf behind the curve of the settee. Behind the settee are (3) oval porthole style windows that are typical of the larger Neptunus series of motoryachts of this era. Each window has a new Roman shade and an upholstered valance. To the starboard side upon entering is the Burlwood entertainment cabinet which consists of a LCD TV, a Sony DVD player and a cabinet above with a Pioneer 12 volt AM/FM/CD player, a Terrestrial TV antenna booster and a speaker volume control for the Aft Deck. In a cabinet next forward is the Raymarine Sat TV control box, plus CD and DVD storage. Next forward are (2) newly reupholstered occasional chairs separated by a Burlwood and lacquer finished end table that has a pullout bar storage drawer. Atop is a table lamp. Behind each chair is additional storage via (4) cabinet doors. The same (3) porthole type windows are above this area with Roman shades and valances to match those to port. Also in the Salon is a soffit type Air Conditioning delivery around the perimeter of the area, a soffit type ceiling detail with rope lighting over the coffee table, (11) LED mini spots overhead, Alpine 2 Stage stereo speakers. The area to the starboard side adjacent to the Galley is a great storage area and service banquet running eight feet fore and aft. Storage includes (6) lacquered drawers and four cabinet doors for extra dishes and Galley ware plus lots of household items. The top is Burlwood with artwork pieces above. Next forward is a Pantograph side door that is very useful for loading the Galley or handling lines while running shorthanded from the lower controls. Also in this area is a central vacuum outlet, a Phantom screen for the side door, a smoke detector and (2) overhead LED mini spots. Just forward of the Galley is the Dining Area. A handy pass through from the forward bulkhead of the Galley eases food delivery but also adds visibility to the Lower Control Station to starboard. The Dinette is to port. The seating is U-shaped Ultra Leather off the portside bulkhead on a raised platform for better visibility. The Dinette seats up to (6) and has storage below. A pedestal table with storage in the pedestal lies in the center of the Dinette. The Burlwood trimmed table folds out to be twice its usual size for dining. Large windows to forward and port offer plenty of natural lighting plus there are two LED lights above. There is ample storage forward under the windshield. The Companionway to the accommodations is to starboard opposite the Lower Station all the way forward on the main deck. There are (6) steps to the first landing leading forward to the VIP, (2) more to the Guest Cabin to port and (2) more to the full-beam mid ship Master Stateroom. Two steps down from the top are (2) doors to the very efficiently designed Neptunus electrical panel. Just prior to entering the master is the walk in Laundry Room with a separate Kenmore washer and dryer. Each of the (10) steps has its own LED step light. Located amidship at the end of the Companionway in the widest part of the boat is the Master Suite. Entering from the Burlwood door the king size berth is aft and centerline. The newly upholstered headboard is flanked by two curved backlit Burlwood panels. Above the berth is a two-level soffit with the upper level mirrored and having (4) LED mini spots, two of which are reading lights. Each side of the berth there are two drawer nightstands with light switches and phone outlets built in. At the foot of the berth is lacquered finish entertainment center with DVD player and a Direct TV Sat receiver and (2) cabinets doors below.There is a flat screen TV on the wall, new in 2017. To port starting forward is a vanity with a swing out stool, a centerline drawer and (4) large drawers, (2) forward and (2) aft.Above is a mirrored panel and further above (2) oversize stainless steel portholes covered by Roman shades.Next aft is a two door cedar lined auto lit hanging locker followed by a walk in closet with double hanging rods and a three door cabinet with (3) shelves and a shore rack.The entire closet is cedar lined, carpeted and is lit from above. On the starboard side of the cabin is a lacquer finished chest of (6) storage drawers with a Burlwood top. A mirrored panel and two opening stainless steel portholes behind Roman shades are above. Further aft is yet another double door, cedar lined auto lit hanging locker. Next aft is the Burlwood entry door to the Master Head. Under berth rope lights, built in cabinets,carbon monoxidedetectorin port/starboard AC delivery valances, Vimar built in digital alarm clock, (9) LED mini spots and a central Vac outlet. All bedspreads, shams, throw pillows, Roman shades, valances, headboard and vanity stool are new or were newly upholstered. The Master Head is immense and probably not properly described by the word “Head.” The sole is marble tile to match the countertops. The starboard side outboard vanity has (6) drawers and (2) mirrored cabinets flanking an opening stainless steel porthole covered with a Duette shade. Extending inboard the vanity has (2) double door bow front cabinets under each sink. The countertop is very attractive granite. The China sinks are under mounted and the fixtures above are two tone. The area above the sinks is mirrored. The toilet is a Headhunter Royal Flush model. The tub/shower has a handheld or wall mountable Grohe fixture, an exhaust fan and lights. The tub/shower door is tempered glass. The tub itself is a Jacuzzi type tub. The overhead is mirrored throughout. There are (10) LED mini spots, ample outlets and two-tone fixtures. All the way forward is the VIP Suite with a centerline queen size berth with rope lighting and (2) drawers beneath the berth. A newly upholstered headboard with valance type AC delivery is above the berth. Burled countertops port and starboard at the level of the berth serve as nightstands. Above each countertop is an opening stainless steel porthole covered by new drapes. Also in this area are stereo speakers and rope lighting behind the valance. Above this area to port are seven lacquered finish cabinets with a brass reading light most forward. Aft to port and starboard are (2) double hanging lockers with a cedar lining and auto light. (2) drawers are below. On the starboard side of the cabin the nightstand shelf continues further aft and has extra storage cabinet above for a total of (8) with (2) drawers below. Next aft is a full size double door hanging locker with cedar lining and auto light. The companionway leading aft but still within the suite has (6) more deep storage cabinets at eye level, the entrance to the VIP Head and (2) additional access hatches to bilge systems and storage. Also in the VIP Suite is an overhead Bomar deck hatch with an Ocean Air sliding screen and shade, a central Vac outlet, digital AC controls, Vimar digital alarm clock, (8) overhead LED mini spots and an access hatch to the bow thruster area. All bedspreads, shams, upholstered headboard, curtains and valances are new. The Guest Cabin is next aft to port via the centerline Companionway. There are twin berths running fore and aft with a two drawer nightstand between. Newly upholstered headboards sit on a large mirrored panel with three LED lights in the soffit above. Below the berths are three drawers each facing inboard. Above the berth to both forward and outboard are (11) storage cabinets. Next aft is a full-size cedar lined auto lit hanging locker. Furthest aft is the entrance to the Guest Head. Digital AC control, a Vimar digital alarm clock, (2) stainless steel opening portholes with full drapes, under berths rope lighting and behind the porthole valance, a central vacuum outlet and (2) stereo speakers. The horizontal surfaces and doors in the Guest Cabin are gloss Burlwood. All bedspreads, shams, throw pillows, drapery, headboards and valances are new. The Guest Head is aft but ensuite. A second door from the main Companionway allows it to double as a Day Head. The bow front lacquered finish vanity has (2) cabinet doors below and an Avonite countertop with an under mount china sink and two-tone fixtures above. (2) mirrored medicine cabinets are above the counter. The toilet is a Headhunter Royal Flush full-size model. The sole is Crema Marfil marble. Stainless steel porthole with a shade over vanity. The stall shower has a clear tempered glass door, a light, exhaust fan and a handheld or wall mountable Grohe fixture with soap/shampoo dispenser and (4) LED mini spots, a mirrored overhead and valance type AC delivery. Accessed via the swim platform door just aft of the Engine Room is the Crew Bunk Cabin (2) athwartships berths off the starboard bulkhead. Each berth has (2) drawers and a storage cabinet below. AM/FM/CD/radio, stereo speakers, digital AC control and an LCD TV with DVD player. Flooring is new Amtico vinyl with new vinyl wall covering and new mica storage cabinets and Amtico vinyl sol. Just inside the door and adjacent to the two step entry ladder are port and starboard large storage lockers, large enough for a bicycle. The Crew Head is to port and contains a vanity with a single cabinet door below stainless steel sink in a Mica countertop, two-tone fixtures, a Raritan Atlantees electric head, stall shower with curved sliding door and a wall mountable or handheld fixture, a light, soap/shampoo dispenser and an exhaust fan. “MAGIC MOMENT” represents a high volume 70’ motoryacht with an excellent allocation of space. The Neptunus ride is legendary and “MAGIC MOMENT” is no exception. T/2000 Series MTU’s provide great cruising speeds. Twin generators provide all the power you will need. Great opportunity to move aboard and cruise! Fresh bottom paint and service 1/2018.